Pay for 4 nights, get 2 nights free! Spend the day on pristine Lake Chatuge then pull your boat into Lake Side Serenity's covered boat slip. Then enjoy your time at Lake Side Serenity. Lake Side serenity has 4 bedrooms: 1 queen size bed, 1 queen size bed, 1 queen size trundle bed, and 1 twin bed. Additionally there are 2 sleeper sofas. On the main floor is the kitchen with a large dining table, a living room with a floor to ceiling stone fireplace, 2 bedrooms and 2 baths and a large covered back porch. Relax on the back porch in the swing or rockers as the burgers are cooking on the grill. On the lower level is the rec room with a pool table and basketball hoop, 2 bedrooms and 1 bath. When you aren't out on the lake, try your hand at a game of indoor hoops or pool. 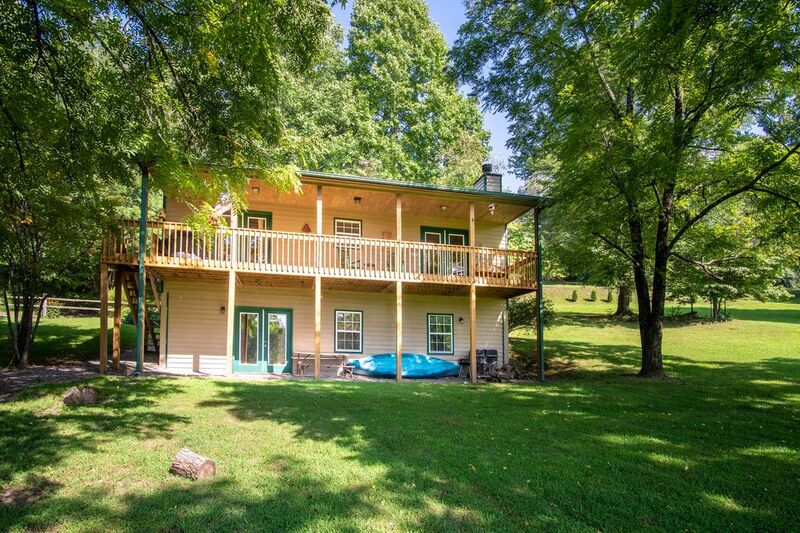 If you are looking to spend some time boating on the lake and then a family friendly home to spend your time off the lake then it is time to check into Lake Side Serenity. Please note - the driveway to this house is gravel and steep. A four-wheel drive is not required but a vehicle with good traction will assist in getting in and out of the driveway. Cell service is limited. The paved boat ramp pictured is not always accessible because of the water levels being different and not all boats can fit on the ramp. PRIOR TO BOOKING PLEASE REVIEW THE RENTAL AGREEMENT AND ALSO NOTE THAT WE "DO NOT" ALLOW PARTIES. When payment is submitted you are agreeing to Little Bear Rentals Booking Agreement and House Rules. Clean. All the comforts of home! Enjoyed our weekend! The driveway is steep and it rained quite a bit during our stay. Made it a little difficult to get to the road. Be forewarned and consider the weather. Worth that small adventure!!! Our family enjoyed our stay at Lakeside Serenity. The house is furnished well and the kitchen is stocked very well. All we had to bring was our clothes and personal items. Linens are stocked as well as towels and paper products, hand soap, bath soap. I can't say enough good things about the house. The view of the lake is somewhat obstructed by trees and it is a downhill walk from the house. But overall we had a great time. The owner may consider posting new pictures. Home is in much better shape than in pics. Everything was very clean and neat. It looks as if home is freshly painted. Over all our stay was very good. The boat ramp is steeper than it appears. Also we were surprised by the "smell" of the water in the house. It had a "Florida or South Georgia" smell - different than what we are used to in our mountains. Thank you for your stay with us and for the review. Wish we had of known about the smell of the water while you were staying with us, however when you checked out and told us about the problem we went right out there and adjusted the filtration system. Again thank you and we look forward to you coming again. Clean, well maintained and just like the pictures! we are glad you enjoyed your stay with us !